#Famous is hands down my favorite book of the year so far! I absolutely adored the characters and couldn't put the book down. It was fast paced, quirky, and downright hilarious. I typically enjoy a good romantic comedy, but this one sucked me in even more than usual. The story was so realistic and made me feel like I could become #famous overnight (crossing fingers/wishing on a star)! I thoroughly enjoyed the main characters and loved how Rachel and Kyle had totally opposite personalities but had such great chemistry. Another thing I found interesting was the discussion of the new age approach to bullying. Kids these days experience bullying in a totally different way than I did in high school, and it was eye opening to see how social media can bring you up to your highest highs, or it can belittle you and bring you to a very low place. I truly admired Rachel's strength throughout the story. She handled the bullying with grace and became a stronger person because of it. I think she's a great role model for teenage girls who experience bullying through social media. 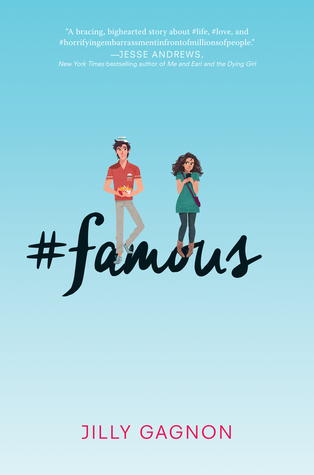 All in all, #Famous was a fast paced and enjoyable read from start to finish. I laughed, I teared up a few times, and I feel like I learned a little too. I loved the style of writing, the characters, and the story, and I will be recommending this book to all lovers of the YA contemporary genre! This is my first 5 star read this year and I'm so excited for you all to read it! This sounds so fun! I love that it tackles a tough issue while still being quirky and fun. I need to read this! Great review! Thanks for linking up on Saturday Situation.